Tap pet i - Ardebil.jpg ARDEBIL Al mare. Bukara BUKARA. Passatoia Marocchina. Passatoia Al mare. Tappeti - Mashed1 95x105.jpg MASCHED. tappeti persiani.annodato a mano con certificato di autenticita misura 186x103. La condizione Ricondizionato dal produttore. Spedito con Posta raccomandata standard. Lotto di 5 tappeti persiani originali in buone condizioni. Acquistati tra Istanbul e Teheran negli anni 70/80. Etichette in persiano ne provano l'autenticità anche se non sono in grado di definirne il modello. Contattare per ulteriori foto e informazioni o prezzi del singolo tappeto. Disponibile per poterli visionare e ritirare dal vivo. COPPIA Tappeti PERSIANI Royal Shiraz SCENDILETTO misura 40X90, trama ed ordito in cotone e vello in lana annodato a mano al 100%. I tappeti sono puliti, nuovi. Vendo questi tappeti che erano di mia zia, 3 persiani e 1 fantasia cane e aquila, vero affare, li vendo a malincuore per motivi di spazio. FOTO 1 MISURA 3,98 X 86 150,00. FOTO 8 MISURA 2.98 X 1,20 300,00. FOTO 7 MISURA 1,80 X 1,22 150,00. FOTO 6 MISURA 2,48 X 96 150,00. Bel lotto di tappeti persiani autentici, non nè sò molto di più ma sono sicuro della loro autenticità, il primo diciamo di colore arancione è lungo 1,23 cm. per una larghezza di 87 cm. il secondo di colore bianco è lungo 1,53 cm. Lana Tradizionale pers Tappeto Annodato a Mano Tappeto 210 x 134 cm bellissimo. Hello. Nice pers traditional wool hand knotted carpet rug. Good clean washed condition no staines or worn patches or damages. 210 x 134 cm size. 100% wool pile. Thank You. 410x300cm 13'8"x10'. An Old Shabby Chic Traditional Hand Made Persian Oriental Carpet. Very Nice Wool Piles Hand Made Persian Carpet. The Carpet is not perfectly rectangular or evenly straight due to being handmade. 323x62cm 10'9"x2'1". Very Nice Wool Piles Hand Made Persian Oriental Runner. An Old Traditional Hand Made Persian Oriental Runner. The Runner is not perfectly rectangular or evenly straight due to being handmade. 233x162cm 7'9"x5'5". An Old Traditional Hand Made Persian Oriental Rug. Very Nice Wool Piles Hand Made Rug. The Rug is not perfectly rectangular or evenly straight due to being handmade. This rug or carpet is 100% handmade. 253x190cm 8'5"x6'4". Very Nice Wool Piles Hand Made Persian Oriental Carpet. An Old Traditional Hand Made Persian Carpet. This rug or carpet is 100% handmade. The Carpet is not perfectly rectangular or evenly straight due to being handmade. 299x200cm 10'x6'8". An Old Shabby Chic Traditional Hand Made Persian Oriental Rug. Very Nice Wool Piles Hand Made Rug. The Rug is not perfectly rectangular or evenly straight due to being handmade. This rug or carpet is 100% handmade. 283x207cm 9'5"x6'10". An Old Traditional Hand Made Persian Oriental Rug. Very Nice Wool Piles Hand Made Rug. The Rug is not perfectly rectangular or evenly straight due to being handmade. This rug or carpet is 100% handmade. 208x165cm 6'11"x5'6". An Old Traditional Hand Made Persian Oriental Rug. Very Nice Wool Piles Hand Made Rug. The Rug is not perfectly rectangular or evenly straight due to being handmade. This rug or carpet is 100% handmade. 181x87cm 6'x3'11". An Old Traditional Hand Made Persian Oriental Runner. Very Nice Wool Piles Hand Made Persian Animal scene Runner. The Runner is not perfectly rectangular or evenly straight due to being handmade. 294x197cm 9'10"x6'7". An Old Traditional Hand Made Persian Oriental Rug. Very Nice Wool Piles Hand Made Rug. The Rug is not perfectly rectangular or evenly straight due to being handmade. This rug or carpet is 100% handmade. An Old Traditional Hand Made Persian Oriental Rug. Very Nice Wool Piles Hand Made Persian Rug. Pile Wool & Cotton. The rug is not perfectly rectangular or evenly straight due to being handmade. This rug or carpet is 100% handmade. 217x127cm 7'3"x4'3". An Old Traditional Hand Made Persian Oriental Rug. Very Nice Wool Piles Hand Made Persian Rug. The Rug is not perfectly rectangular or evenly straight due to being handmade. This rug or carpet is 100% handmade. 290x200cm 9'7"x6'7". 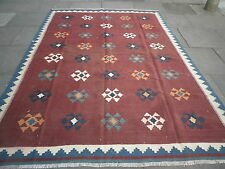 An Old Traditional Hand Made Oriental Persian Large Kilim. Very Nice Wool Piles Hand Made Kilim. The Kilim is not perfectly rectangular or evenly straight due to being handmade. Foundation Wool. Hello. Nice pers wool hand knotted Keshhan carpet rug. Good clean washed condition no staines or worn patches or damages. 312 x 204 cm size. 100% wool pile. Thank You. 299x203cm 10'x6'9". An Old Shabby Chic Traditional Hand Made Persian Oriental Rug. Very Nice Wool Piles Hand Made Rug. The Rug is not perfectly rectangular or evenly straight due to being handmade. This rug or carpet is 100% handmade. 317x108cm 10'7"x3'7". Very Nice Wool Piles Hand Made Persian Oriental Runner. An Old Traditional HAND MADE Persian Oriental Runner. the runner is not perfectly rectangular or evenly straight due to being handmade. Hello. Beautiful Indo Joshaghan wool hand knotted carpet rug. Good clean washed condition no staines or worn patches or damages. Small imperfections to talasses, fringes. 307 x 247 cm size. 100% wool pile. Thank You. 290x159cm 9'8"x5'4". An Old Traditional Hand Made Persian Oriental Rug. Very Nice Wool Piles Hand Made Persian Rug. The Rug is not perfectly rectangular or evenly straight due to being handmade. This rug or carpet is 100% handmade. 280x47cm 9'4"x1'9". Very Nice Wool Piles Hand Made Persian Oriental Runner. An Old Traditional HAND MADE Persian Oriental Runner. the runner is not perfectly rectangular or evenly straight due to being handmade. Dimensions to follow but approx one meter at smallest point. In vintage condition showing minimal signs of wear and normal colour fading. Beautifully hand crafted with tight stitch. A great addition to any serious collection. Collection available, delivery can be arranged. Thanks for looking!